Rose Society growing strong in numbers and events! The Ole Miss Women’s Council for Philanthropy’s annual fund giving program, the Rose Society, has been busy growing new branches this fall. From a single recruitment event to the Song Writers Soiree, there has been growth of more than 20 new members this fiscal year to date! Rose Society members contribute $1,000 a year to support the programmatic aspects of the Women’s Council program— the mentoring, leadership training and cultural enrichment activities. The Council scholarship endowments ensure ample scholarship support, but it is the annual giving that provides students with training, tools and connections no other program at Ole Miss can match. Lib (Wight) and Neal Quirk graciously hosted a Rose Society recruitment event in Atlanta in early October. Joined by University Foundation staff, were board members Mary Haskell, Karen Moore and Ginger Clark. OMWC Alumni Scholar, Ashley Mathis (Perryman) spoke to the Atlanta group about her experience as an OMWC Scholar and was instrumental in delivering the impact the much needed funds have in one’s college career. Mathis was also one of the new generous donors of the Rose Society that evening. Another great event that recently took places was the Songwriter Soiree on October 27 at the Lyric on the Square in Oxford. More than 180 attendees came out to hear Rivers Rutherford and his friends, Tom Douglas and Brett James perform many of their country hits they wrote. The festive decorations and food really helped jumpstart the Halloween weekend festivities and all had a grand time at this unique opportunity. 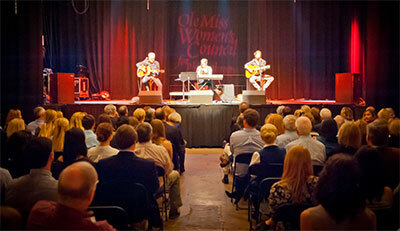 The Songwriter Soiree is an annual event to thank Rose Society members for their continued support of the OMWC program. Coming up this winter, the Rose Society recruitment events will take place in Texas. Stay tuned for more information or click here to learn more about the Rose Society.